“I am thirty nine years old and possibly the oldest in my class, which shows it is never too late to change career. This year has been both enjoyable and difficult and I learned many useful skills to help me to progress to higher education. I am going on to do an HNC/HND at Glasgow Kelvin College, City Campus." “I was training as a hydrologist, but was paid off with no qualifications except Standard grades. I wanted to better my position in life. I am now going to study mechatronics at university and I would like to be involved in closed circuit regeneration projects in the future. SWAP is a great platform for Higher Education”. “After high school, I worked for my family’s business and tried college, without success. During the SWAP programme, I put my head down and worked on my subjects and English. I am determined to follow my dream of building the robot I have been dreaming about! I am going to study mechatronics at the University of Glasgow and hope to participate in robotic projects”. “Prior to this course, I was a full time carer for an elderly relative. I returned to study on the SWAP programme to secure a better future and pursue my dream of working with aircraft and dynamics. The workload during the course has been relatively easy and the assistance and feedback from lecturers has been great. I look forward to completing a degree in aeronautical engineering at Glasgow and possibly moving towards an MEng or even PhD”. “I was working as an energy adviser for British Gas before SWAP. I found the SWAP year to be very challenging, rewarding and exciting. I am now going to study engineering at City of Glasgow College and I hope to pursue a career in the offshore oil and gas industry”. “Before I started the course, I was working part-time and doing ESOL classes. I really enjoyed the experience of access to engineering, especially the way it was structured and delivered. It is a dream of mine to study civil engineering and I will study HND in Civil Engineering at GlasgowKelvinCollege, hopefully followed by university”. “Before college, I was working in a minimum wage job in a sports centre and wanted to work towards a better career in the marine or offshore industry. SWAP is a good platform to higher education and I have enjoyed my time learning. I’m happy to be going to study marine engineering through Clyde Marine Training”. “I was working in a club behind the bar before returning to college and wanted a change and to learn new skills for a career. I am undecided on what I am doing next. The course has been very useful and the lecturers helpful”. “I spent most of my days looking after my Gran before starting SWAP. I am going to study mechanical engineering at Glasgow Kelvin College and later find a career in engineering. 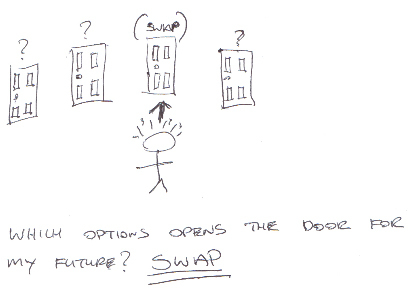 My SWAP experience has been very good and I have enjoyed the test of being back in education”.